The official ballot for the November 3, 2015, election has been approved. The portion of the ballot pertaining to Initiative 42 is shown below. Note that the official ballot features the revised fiscal analysis which contains false information about Initiative 42. 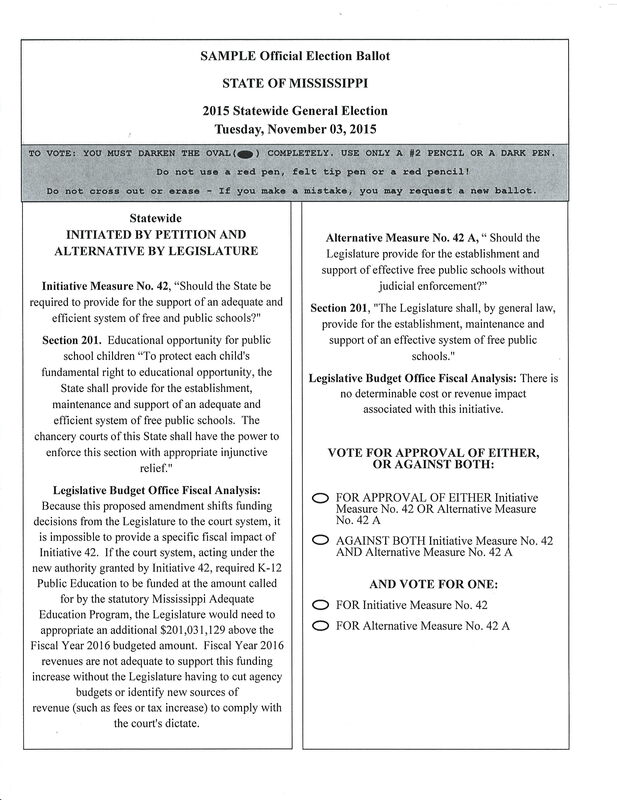 For comparison, the text of the original fiscal analysis is shown below the ballot. The cost to fully fund the Mississippi Adequate Education Program (MAEP) statutory formula portion of the Fiscal Year 2016 budget request as submitted by the Department of Education totals $271,136,036 above the Fiscal Year 2015 funding level. Initiative 42 amends Section 201 of the Mississippi Constitution to require that the legislature must fund an adequate and efficient system of free public schools and also authorizes the chancery courts to enforce this section with appropriate injunctive relief. The Legislature would need to appropriate an additional $271,136,036 above the Fiscal Year 2015 level for the support of the Mississippi Adequate Education Program to meet the statutory formula for Fiscal Year 2016. Budget projections for the Mississippi Adequate Education Program for the Fiscal Years 2017 through 2020 reflect average additional formula increases of approximately $33 million annually.